The top two ranked teams in Eight-Man, Division II will square off on Friday with a trip to the state title game in Newton on the line. The second-ranked Pike Valley Panthers will travel to Hanover to take on the top-ranked Wildcats. Pike Valley reached the sub-state game with dominating wins over Wakefield (54-8) and Hartford (60-14). In Saturday’s win over Hartford, the Panthers led 22-0 after the first quarter and 46-14 at halftime. Quarterback DeVante Hammer passed for 196 yards and four touchdowns in the win. Cole Strickler caught four passes for 117 yards and two scores, while Blaze Payeur and Heath White also caught touchdown passes. The Panthers, under veteran coach Don Melby, average 258 yards rushing and 110 yards passing per game. Junior running back Lane Peters is Pike Valley’s primary ball carrier. Peters, a Kpreps All-State selection with nearly 1,600 yards and 30 touchdowns as a sophomore in 2015, has rushed for 1,437 yards and 28 scores this fall. Peters rushed for 144 yards and three touchdowns in the win over Wakefield and 122 yards and three more scores against Hartford. Hammer has completed 61 percent of his passes for 1,105 yards and 22 touchdowns with just one interception. Strickler is the Panthers’ leading receiver with 28 catches for 643 yards and 13 scores. Pike Valley’s lone loss came 34-32 to an Osborne team that has reached the Eight-Man Division I semifinal. Hanover is trying to get back to Newton for a second consecutive season, albeit in a different class. The Wildcats were Division I runners-up last fall to Spearville. Hanover features senior quarterback Will Bruna who garnered Kpreps All-State honors last fall in throwing for an incredible 3,452 yards and 56 touchdowns while adding 650 rushing yards and 18 scores. Bruna threw for 140 yards and three touchdowns in the Wildcats’ 62-6 win over Hutchinson Central Christian on Saturday. He also had a pair of touchdown runs in the game. But with all the offensive capabilities, the Wildcats 2016 story has really been the defense. Hanover has allowed a total of 50 points all season and has posted four shutouts. Only Beloit St. John’s-Tipton has scored in double digits against the Wildcats in a 38-12 first-round loss last week. Pike Valley defeated St. John’s-Tipton 40-34 in district play. The Wildcats held Central Christian to six points after the Cougars put up 108 in their playoff win over Lebo. Junior Carlos Emanuel (6-5, 290) has been the anchor of the defensive line and the Wildcats have the skill players to fly all over the field. This is the second matchup of year between the District 6 foes. Dighton defeated Sharon Springs-Wallace County, 42-32, in Week 6 and captured the competitive district that featured four teams that were ranked at some point during the year. Dighton (11-0) earned a last-second 36-30 home victory against Otis-Bison in Week 7 and then rolled over Hodgeman County (58-8) to capture the district crown. In the playoffs, Dighton defeated Lakeside-Downs, 62-8, and Chase, 51-6. Dighton has enjoyed a six-win improvement from last year when it had a co-operative agreement with Healy and has matched the best finish in school history. In 1995, Dighton made the sub-state title game. The only other finish outside of the top-16 came with a quarterfinal showing in 2013 when the Hornets fell to Sharon Springs-Wallace County in the regular season and then again in the playoffs. 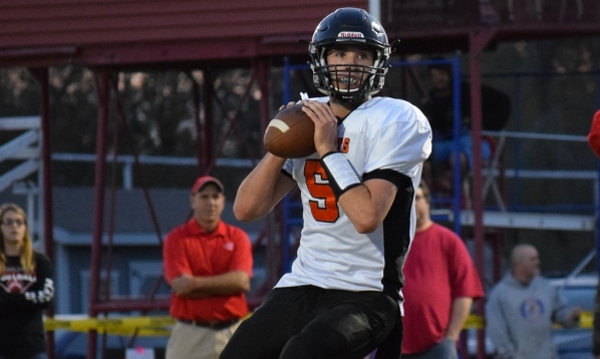 Dighton senior quarterback Tyler Lingg, a four-year starter, and wide receiver Dylan Foos are among the top passing duos in eight-man history. Lingg is challenging several state single season and career marks for passing completion rate. In the regular-season win over Wallace County, Lingg completed 13 of 21 yards for 158 yards with four scores. Wallace County defeated Stockton, 48-18, and South Barber, 28-0, in the playoffs. The Wildcats, known for their defense and running game, are in the postseason for the 11th straight year, the longest current run in eight-man football. Since a runner-up showing in ’13, Wallace County lost to eventual champion Victoria in sub-state the last two years. The Wildcats have not allowed any points in the last six quarters. Wallace County, which has a forfeit win, has an average score of 38-20. Dighton is at 54-11 after it allowed 29 points a game last year. Sharon Springs has received standout years from several players, including quarterback Levi Johnson, fullback Grady Hammer and lineman Chisum Grund. The Wildcats had five non-offensive scores in their first nine games. The coaching staff has delivered another great season behind an offense that’s often been outgained. Entering last Saturday, Wallace County had outgained opponents by just plus-8.1 yards per contest and had won two key games against Hoxie and Otis-Bison when the Wildcats were outgained. In the last four years, Sharon Springs has lost just six times. The common thread has been strong passing attacks from opponents, especially in the second half. In the ’13 state game, Baileyville B&B, led by quarterback Dustin Rottinghaus, completed 25 of 49 passes for 395 yards with four scores. In ’14-’15, Victoria, paced by Brady Dinkel, finished 13 of 18 for 214 yards and five passing scores, including key plays in the second half. This season, St. Francis defeated Wallace County in Week 1 behind 6 of 12 passing for 101 yards from quarterback Quinton Cravens and completed a Hail Mary touchdown at the end of the half. As well, Wallace County permitted 245 passing yards in a win against Hodgeman County this year. If Dighton was a power-running team, it probably favors the Wildcats. However, the Hornets’ passing game is exceptional behind Lingg and Foos and an experienced front.